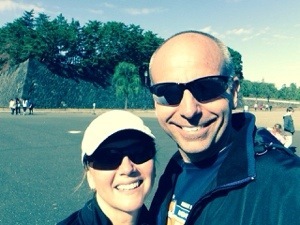 This morning we participated in the Tokyo Race for the Cure…a great event for a great cause. Also, it helped clear room for tonight’s second (of three) Thanksgiving meals. This entry was posted in culture, julie, mike on November 30, 2013 by jules453. With this being our first Christmas in Tokyo, we’ve been getting a lot of questions about how the holiday is celebrated here. First, since Thanksgiving is obviously not recognized, the “Christmas Season” starts early (basically, the first week of November). Second, similar to our experience in Hong Kong, Christmas seems to be regarded as one of the several annual seasonal celebrations; albeit one of the biggest ones. 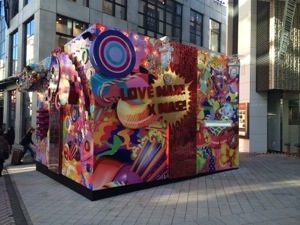 The following Christmas display, which we came across in Shibuya, is a good representation of how the holiday is viewed…a great happiness party! This entry was posted in culture, mike on November 29, 2013 by jules453. 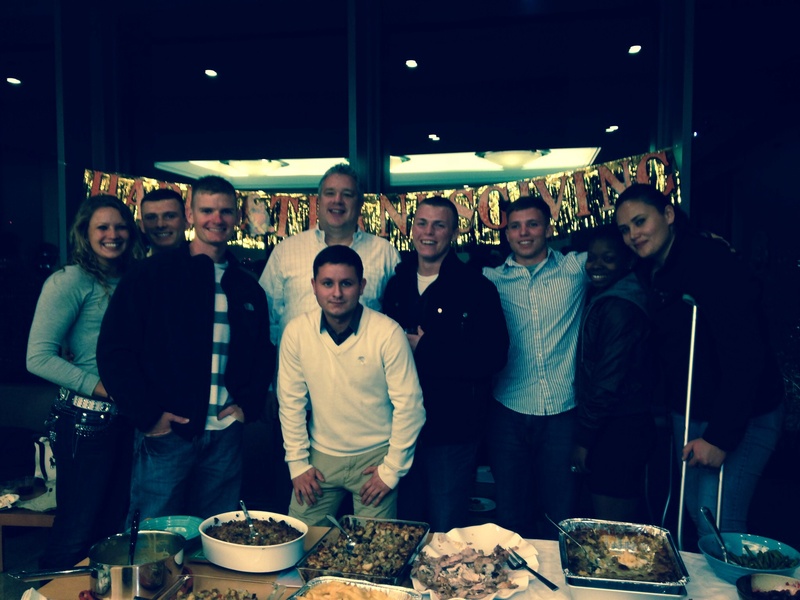 This entry was posted in julie, Uncategorized on November 29, 2013 by jules453. In Japan, there is this cow. Inside of this cow is this perfectly marbleized meat. The fat is mixed throughout the meat to create a more evenly cooked piece of meat and a more delicious bite. 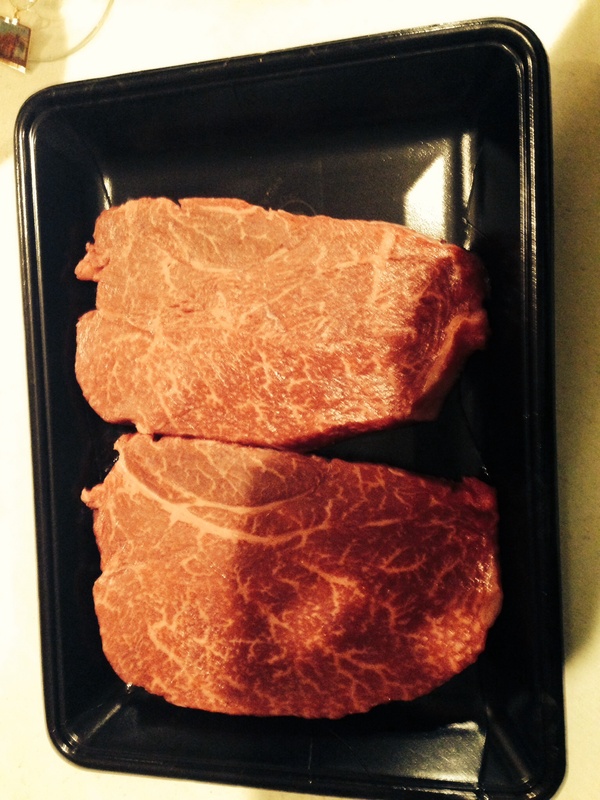 A little while ago, my parents purchased this meat. My Dad cooked it to perfection. It was so good, the best steak I have ever had. The price was 4,000 yen or $40.00. But it was worth it. We probably won’t get it that often, but it’s so good. This entry was posted in food, meg on November 16, 2013 by jules453. 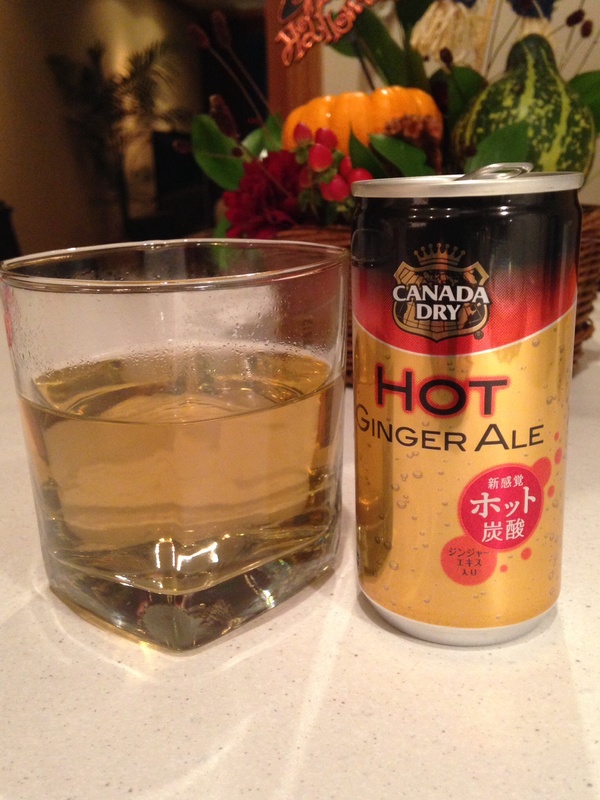 For ¥120, one of the fall/winter offerings is Hot Ginger Ale. It tastes exactly as titled: it is a 180 ml ginger ale soda served hot. It is stored in the hot beverage warmer in the store and opens just like a cold can of soda. It is refreshing and soothing at the same time. This entry was posted in food, julie on November 15, 2013 by jules453. 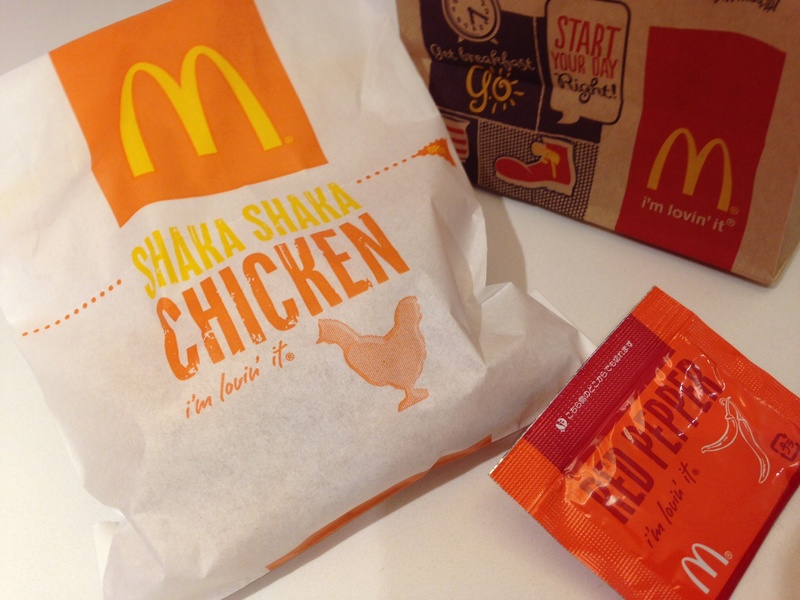 As you know, we enjoy chasing down the latest “it” thing here in Tokyo, and, our most recent quest was for the Shaka-Shaka Chicken at McDonalds. ¥120–a real deal. I had heard about it a couple times in the past week and almost immediately decided we needed to find some. 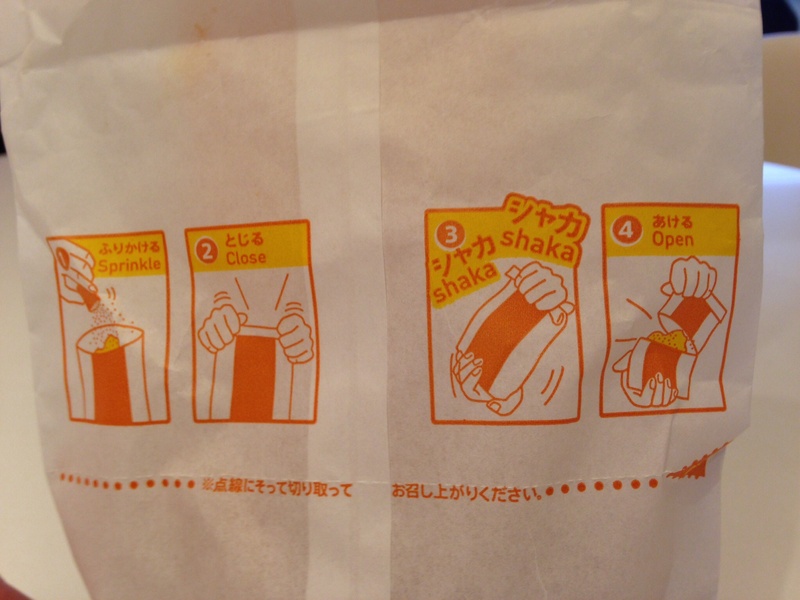 My Japanese teacher taught me how to order it in Japanese during my lesson this week: “Shaka-shaka chicken, hitotsu onegaishimasu”. (Shaka-shaka chicken, one please.) First, I practiced my big phrase a lot. Seriously, I’m good at it. Then, I went to the small McDonalds at the nearby Kamiyacho station. I practiced my order all the way down the hill. When I arrived, I saw that the picture on the menu board in the window was taped over, so I figured that item wasn’t available in the tiny outlet. No big deal. The next day, I went to a bigger McDonalds in Azabajuban. But there too, the photo was blocked out on their poster. When I relayed my dismay to the rest of the family, Meg piped up that she just had it during “Tokyo Culture Days!” She ate it at the BIG McDonalds in Ropongi (just up the big hill from our apartment.) BINGO! Sounds like the perfect birthday lunch to me. Saturday, we took the whole gang up the hill, even Xeno, to the big McDonalds in Ropongi. The girls and I went inside to the second floor to order. I used my Japanese words. I ordered my powdered topping–red pepper. We paid. They gave us the powdered topping. Then, a guy who spoke some English came out and said that Shaka-Shaka Chicken is finished. There is no more Shaka-Shaka Chicken. No more Shaka-Shaka Chicken. This trend has been hot for several years as we have sinced learned, but we missed it. By mere days. This entry was posted in culture, food, julie on November 12, 2013 by jules453. 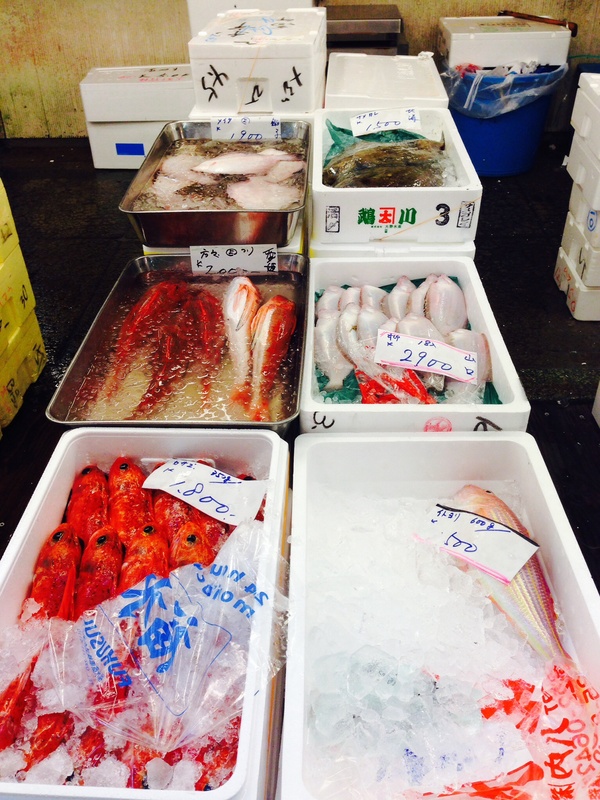 For Tokyo Culture Days, we took a trip to Tsukiji Fish Market. 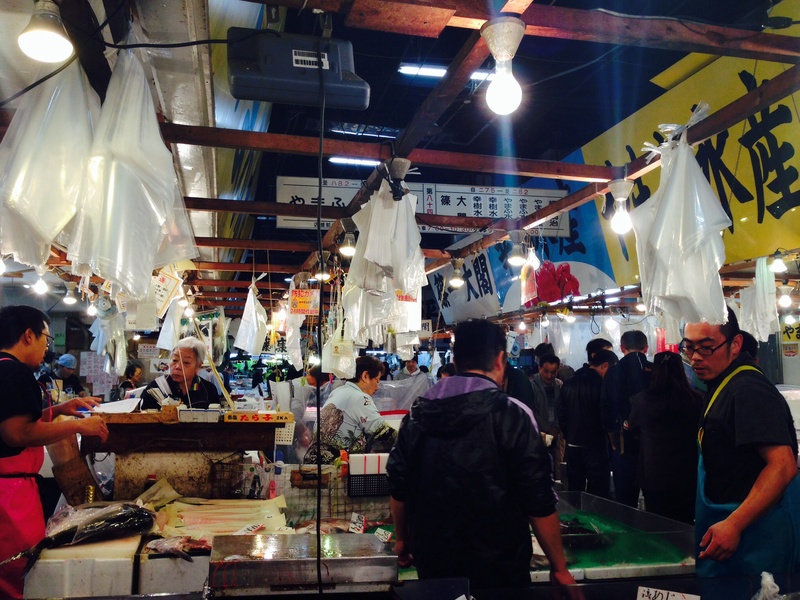 It is a big covered area with hundreds of vendors that sell fish and fish-parts. The smell at first is a lot to handle and is pretty harsh. After a while, when you are deeper into the forest of fish, you get used to the fishy-ness. 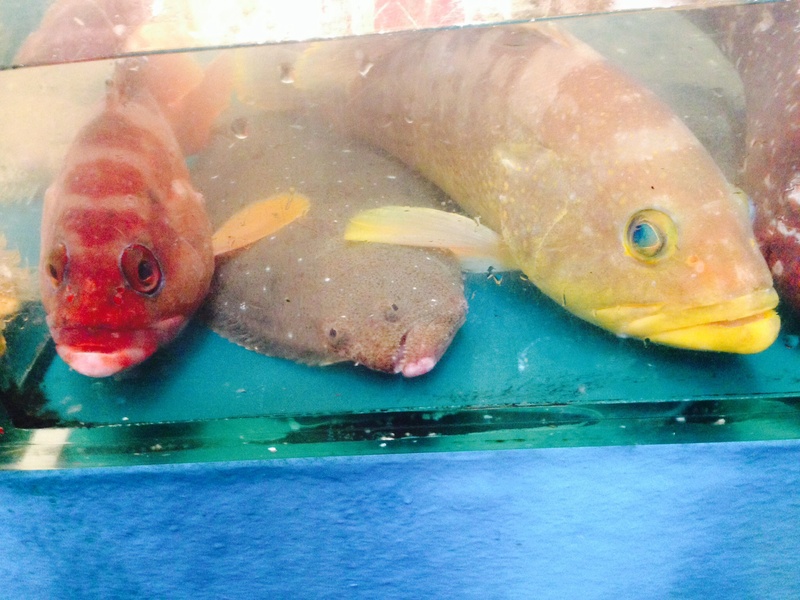 There is a wide variety fish. 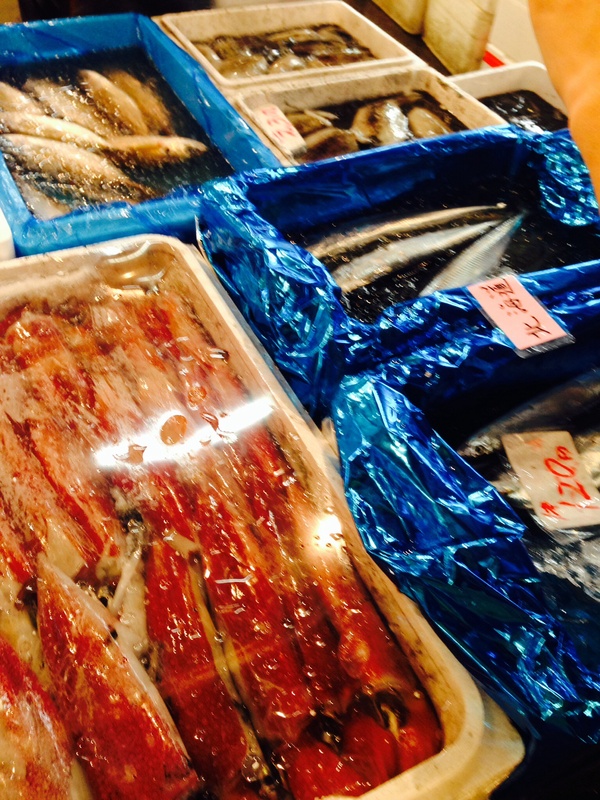 From sardines to octopus, you can get it all. We didn’t get there early enough for the tuna auction but I’m glad we didn’t because otherwise my experience wouldn’t have been so enjoyable. After my group walked through the market, we tried some sushi. It was so fresh and enjoyable. The best sushi I’ve had. We had the lean tuna, fatty tuna, and some sort of octopus I think. It was really interesting to see the biggest fish market in the world and to think that fish come from all over the world to be sold from the place where I was to then be taken to wherever they were sold to. 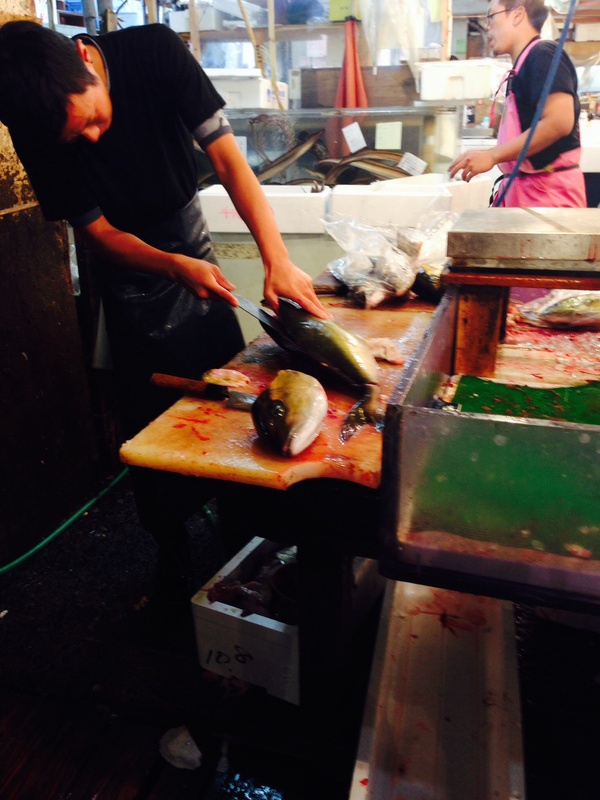 The complicated layout, the stinky fish, and the delicious sushi, all together make one spectacular experience. This entry was posted in culture, food, meg on November 11, 2013 by jules453.